Are We Out of Alignment? Svaroopa® yoga is all about alignment. In every Master Yoga program, you learn how the precise physical alignment provides you with the experience of svaroopa, your Divine Essence. The Ashram offers Svaroopa® Vidya teachings and meditative practices, focused on alignment with Grace. This empowers you to live in the experiential knowing of your own Divinity all the time. But on the organizational level, our two organizations and Boards are looking at the question – are we out of alignment? While we have been collaborating on key courses and events for four years, we are duplicating administrative work in some areas. These inefficiencies affect our ability to serve you in the most effective way. With Sharada Macdonald now serving as Business Administration Manager for both SVA and MYF, it has helped to spotlight these areas. Our organizations, both so focused on your alignment, are also working on our own…. Click here for FAQs about this. We absolutely need community input on this. Click here to give us your perspective, answering a short questionnaire – 6 questions. Help us determine what level of collaboration will best benefit you, so we can provide the yoga services and courses that you need and love. This entry was posted in Master Yoga Foundation, Svaroopa Conference, Svaroopa Vidya Ashram and tagged Ashram, Business administration, Sharada Macdonald on July 23, 2013 by Svaroopa Vidya Ashram. Chanting the sun up every morning, sitting under the canopy of mango trees — this is one of my most powerful memories from my early years of study: Shrii Guru Gita in my Baba’s Ashram. 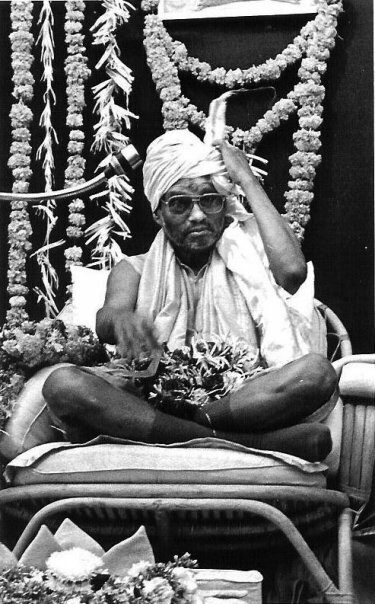 In the rainy season and when it got too cold, we moved indoors to the temple with a life-size statue of Bhagavan Nityananda. I used to tune the tambouras before the morning chant, a daunting task to get all 7 of them in tune together! And before 5:15 am! The morning chant is delicious no matter where it’s done: in the Ashram, in your home, on an airplane (quietly, of course!) and even sitting on elephant back as described in the text. But at sunrise, outdoors, it’s something really special. That’s what the Temple Fund is for. It is my pleasure to announce that our Temple Fund is fully funded, due to the generosity of many donors, large and small. We announced this plan last January as part of the Ashram’s fundraising goals. We made headway but since then we’ve been graced with full funding and are moving ahead full-steam. We’re putting in a gazebo, something that is appropriate to our neighborhood, with landscaping to make it a gem in our backyard — yet it is more. The whole plan is a capital project, meaning we’re taking care of the Ashram building and property. Thus we’re also upgrading our furnaces and reconfiguring the system to eliminate the hot and cold spots throughout the building. Both the furnaces and gazebo will be completed this summer. I’m looking forward to beginning my morning practices outside once the gazebo is completed, anticipating being able to use it for three of the four seasons. We are planning some soundproofing panels so that we can chant without disturbing our neighbors, though I doubt they would be disturbed by someone worshipping the Divine in her own backyard. The gazebo design will be based on mystical geometry as described in the texts. We’ll include a pedestal in the middle, where we can place a photo and flowers (for now) or a sacred statue (perhaps in the future). Someone said to me recently, “This is the center of the Svaroopa® Universe.” Yes, it’s true. Yet you must remember that the center of the universe is in you. You are the center of your own universe, and whole universe is contained within you. Both are true. Outside and inside. Inside and outside. Thank you for giving me an opportunity to create a holy site in the midst of our modern lives. 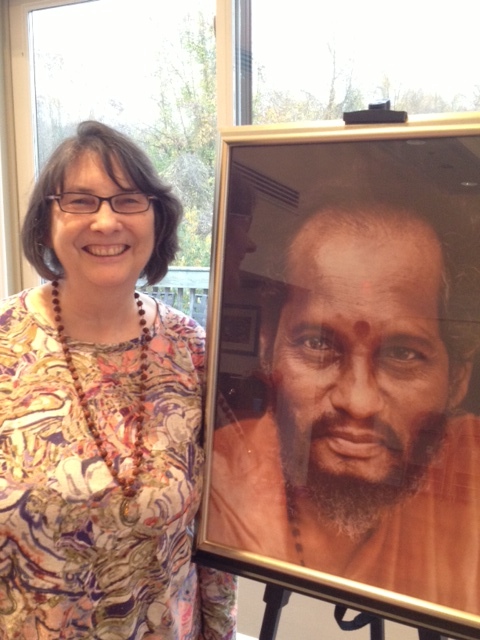 Swamiji has asked me to write about seva and what has changed now that I work with her so closely. What can I say that will make sense? It is such a lovely and Grace filled ride. Being with Swamiji amps up the feeling of Shakti, burns away some of my limited identification and gives me enormous freedom & fulfillment. I release desires to be doing other things and choose the presence of my Guru. This choice holds and guides me like no other. Grace frees me to see and choose my path, my dharma. Seva is like choosing freedom, that freedom that allows Grace to flow more freely. There are so many external practices to pick from but I choose the Self by choosing seva, meditation, practicing japa, and reading & listening to Swamiji’s teachings. They all guide me on the path that I have chosen. Seva always shows me my Self if I look through accepting eyes, letting go of what my mind thinks serving should look like. There is something about this seva of writing for Swamiji that has cleared out the cobwebs in my mind similar to what japa can do for me. I am now ready to clean my house, remove cobwebs and clutter, and simplify, all to make time for more interior explorations and time with Swamiji. Doing seva is like a mini immersion that allows me to remove another layer and another limitation to being the Self. We invite you to consider one of our open sevas: Proofreading, Bookkeeping, Updating courses or links on our website, Research Project, and Musician. 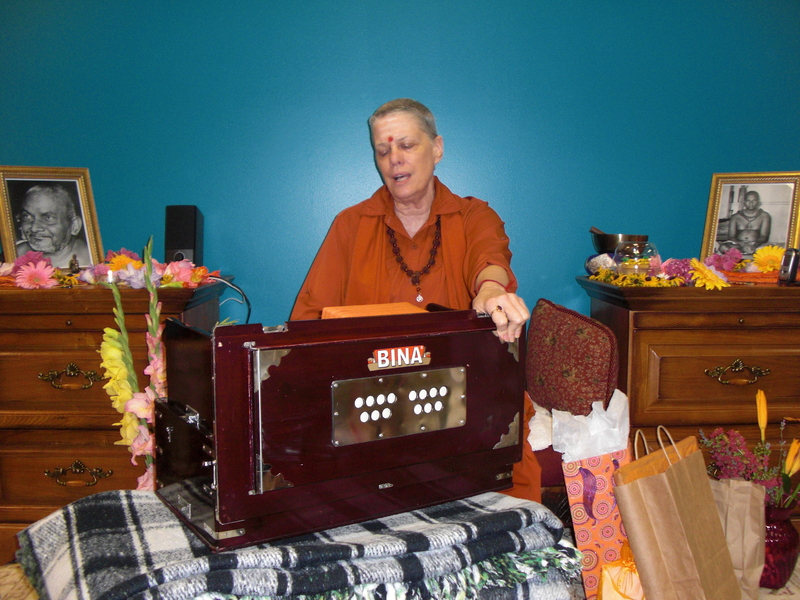 These sevas can be an opportunity to develop new skills as we offer training for your seva. We will soon have a seva list for local positions, in our upcoming Downingtown Yoga email. This will be an opportunity to help Swamiji or our hard-working staff. Click here to make sure you receive the Downingtown Yoga emails. Please email me if you are interested or have questions. I am looking forward to hearing from you and serving you! This entry was posted in Guru, Guru Gita, seva, Swami Nirmalananda and tagged Ashram, Gazebo, Grace, Guru Gita, seva, Shakti, Swami, Swami Nirmalananda, Swamiji on July 11, 2013 by Svaroopa Vidya Ashram. 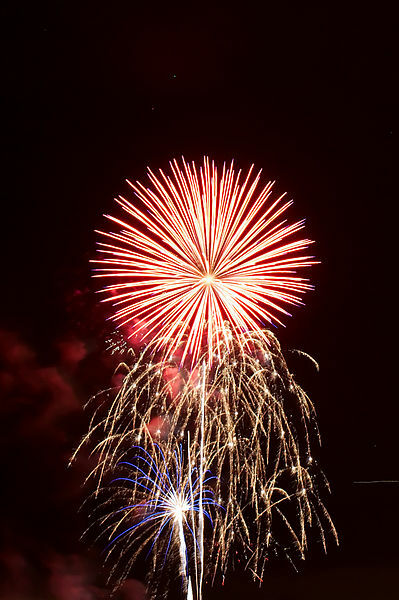 We celebrate America’s birth tomorrow, a celebration of freedom. Yoga says freedom is the goal of human life, but nor merely political freedom — something more. Freedom is a natural quality of being, inherent within your Self. The One Reality that is your own Self is inherently free within It-Self for there is nothing and no one creating bindings. Honored by the name “Siva, that One Reality has taken on bindings to become this world and everyone in it, becoming you and becoming me. Repeat this to yourself — that which has ever-been supremely free, has taken on bindings in order to be me. You may have to repeat it a few times before it begins to percolate through, and then something will happen. That which has ever-been supremely free, has taken on bindings in order to be me. When you get it, something arises inside. It might be a feeling, an understanding or insight, a spinal opening, profound joy or even bliss. All at once, you see that “Siva is choosing to be you. You are so important that “Siva is choosing to be you. “Siva wants to be you. “Siva is enjoying being you. There is a reason for your existence — “Siva is being you. This means you embrace the binding that makes you a limited individual, while you simultaneously recognize the whole of your true identity: “Siva. It’s a little bit like watching fireworks — the fuse is lit and then you wait, nothing happens for a bit and then, boom! You have the limitation of time and space, and the explosion of something into that time and space. Within your own being, the whole of consciousness is expanding ever inward. All you have to do is know your own Self. This entry was posted in Celebrations, Swami Nirmalananda and tagged Shiva, Siva, Swami Nirmalananda, United States on July 3, 2013 by Svaroopa Vidya Ashram.